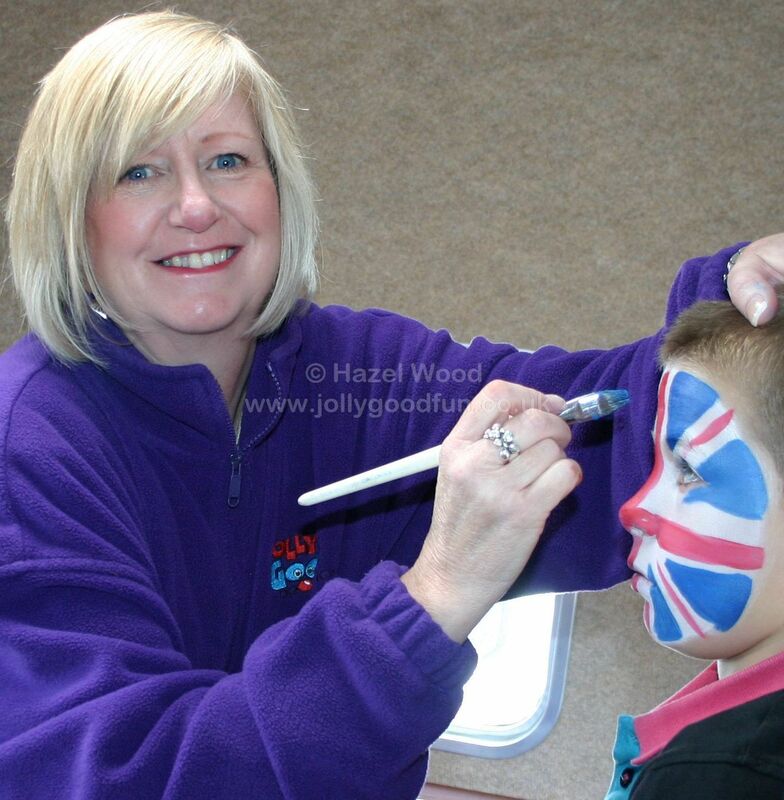 Hazel Wood is a Professional Face Painter available to hire for Family Fun Days, Corporate and Community events in Yorkshire, County Durham and the North East or a birthday party within 15 miles of Richmond, North Yorkshire. Prices from £160, events up to four hours, Yorkshire / North East areas. Face Painting is essential children's entertainment at any type of event either indoors or outdoors. 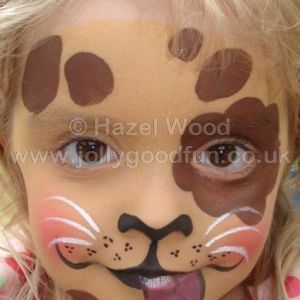 Hazel provides a professional face painting service which you are sure to be delighted with. Hazel is self contained with her own special table and chair. You need to put her in a well lit location and if outdoors provide a tent with a roof and side walls to give protection from sun, wind and rain. At larger events you may need to have more than one face painter. A good face painter can paint about ten faces per hour. If you are expecting several hundred children you may need to have a team of face painters in order to meet demand. Hazel can bring more face painters if you let her know in plenty of time. Hazel is totally reliable and will not let you down at the last minute. She is also hard working and lovely with the children. Parents will be delighted with the quality of Hazel's work and you are sure to get excellent feedback from Hazel's customers. Hazel has full public liability insurance through Equity and follows strict hygiene procedures which is very important for anyone when applying make up or face paint to delicate skin or working near the eyes, noses and mouths of children. In line with manufacturers recommendations and in order not to invalidate insurance cover children under three years of age can have designs on their hand or arm but not on their faces. Face Painting is popular for children's parties. Hazel needs about two hours to paint twenty children. Face Painting can be a background activity running concurrently with other entertainment such as a Magic Show or Punch and Judy Show. Hazel can also provide balloon modelling after the face painting has finished if required and if time allows. Alternatively Hazel can bring balloon animals pretied to give out at the end of the party if required. Glitter tattoos are popular with little girls and they can also be included at extra cost if you wish. Children under three years of age can have their hand or arm painted but not faces ( see insurance above ). If you are having a Bouncy Castle you should check with tell them that you are having a face painter as some bouncy castle suppliers make a charge for cleaning off the face paint afterwards. 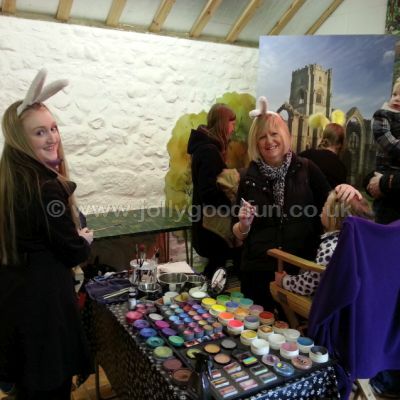 Face Painting has become a popular form of entertainment for adults who seem to enjoy it as much as children. Hazel is often called upon to provide face painting for adults at weddings, balls, corporate events and parties. Ladies often like to have flower designs, masquerade masks or pretty designs on their arms or cheeks. With gentlemen half faces and monster faces are popular. You can also have temporary tattoos although Hazel usual brings a second person to do this. Hazel is a very experienced Face Painter who takes great pride in her work. Hazel is totally reliable and will not let you down. Hazel paints quickly and to a high standard. Hazel's equipment is always immaculately clean. Hazel is great with children and the general public. Hazel only uses the best quality paints. Hazel's set up is impressive with over sixty paints plus glitters and a wide selection of brushes and sponges enabling her to create amazing designs and effects. Face painting at an Easter event. 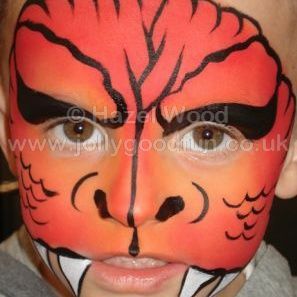 This little boy had his face painted as a dragon. 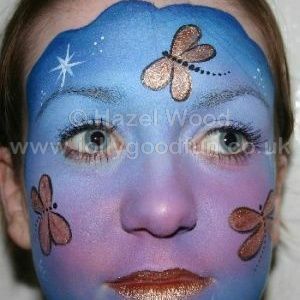 Lovely dragonfly face painting design. This child wanted to have her face painted as a puppy. 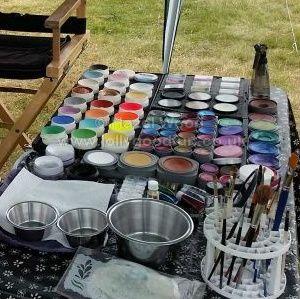 Hazel's Face Painting Equipment set up. Hazel's Face Painting equipment includes over sixty paints and a wide range of brushes and sponges enabling her to create amazing designs.